Through lyrical narrative, the poems in Mandatory Evacuation find radiance in everyday people and subjects by the simple act of noticing—of seeking that which matters most. Like returning home with new eyes after a devastating storm, these poems startle us to awareness, focusing on the passage of time, the beauty of small, fleeting moments, and the importance of paying attention. An elegiac aura and, at times, a sense of menace hang over this compelling collection, adding a layer of poignancy — an ‘impossible sweetness’ — to the quiet beauty that the poems faithfully achieve. Peter Makuck delights in both the natural and human worlds while at the same time diligently ‘looking for what’s lost’ inevitably in the course of a full life. 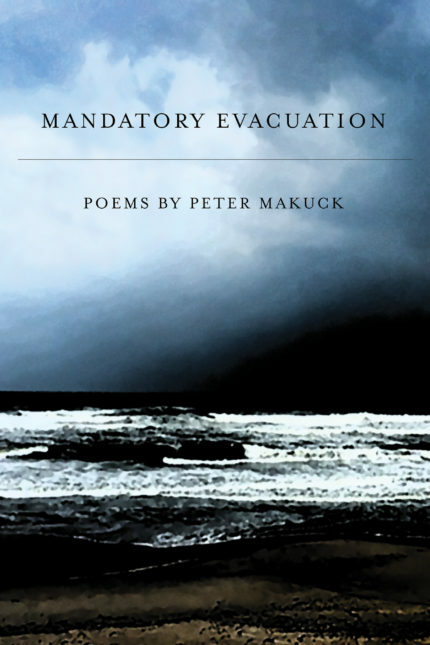 Mandatory Evacuation is mandatory reading for anyone hungry to encounter a thoughtful lyric lucidity that, thankfully, has not yet been lost in contemporary American poetry. As one epigraph to his superb new collection, Makuck cites Cesare Pavese’s observation that ‘we remember moments, not days,’ and it feels impossible to imagine a contemporary poet who evokes, precisely, the moments that give life its texture as keenly as this one. The stunning art of Mandatory Evacuation lies in what at first blush seems its artlessness. So willfully does the poet eschew all look-ma-no-hands ‘poetic’ effect in those evocations that their moving revelations steal upon the reader, who looks up in astonishment, suddenly aware of having been schooled afresh in how to experience the fullness of our world. Peter Makuck takes us into meditative space that is both thought and landscape, where we are caught with him in the ‘tight grip of a scene’ visited by the ‘snares of everyday passions.’ In Mandatory Evacuation, perhaps his finest book, a deeply accomplished poet faces memory and mortality, earth, sea, and spirit with the quiet energy of a lyric voyager. Beginning with the wildflowers and enveloping art of France, a stray melody in a blood-red Spanish sunset, and backed by the red-tiled roofs of Greece where a priest relaxes into the ordinary, the poems move to America’s canyons and distances, and finally to ‘Barrier Island,’ the place where two immensities meet, a spiritual home. The journey ends with an admonition to forget intellectual fads and settle for the world, which is holy, and into the dream of the soul, which is poetry and prayer. We need these songs by a hunter — and haunter — of beauty, that old-fashioned joy, and mystery, that necessity.